This card has the potential to be a good midrange swing coupled with some magnetic mechs coming up for the next expansion! Who else thought he said "Hot Dog!" when he attacked? Better than Sen'jin Shieldmaster tho! Sen'Jin Shieldmasta is more vulnerable to spells. Arcane Nullifier is more vulnerable to battlecries. So basically it's a choice of what you're worried about more: Spells or Battlecries. I don't know if I'd say this is a great card vs aggro; most of the time I would silence something like Tazdingo or Belcher with an Ironbeak Owl. Since this isn't immune to battlecries, it doesn't seem particularly valuable in that role. It also is killed by Stampeding Kodo, unlike its alternatives. 2) Attack it with a large minion, meaning that you get better initiative with your large minions during the next turn's trades (for instance, if they attack it with a giant, that's one giant who now has 6 health and isn't able to kill one of your beefy minions this turn). All in all, not an amazing card. But fairly useful for 4 mana, and definitely more useful the less minions your opponent has on the board. The fewer options your opponent has for attacking, the better trades you will get. It's confusing why people are comparing this to Sen'jin. This is supieror due to that mech synergy. 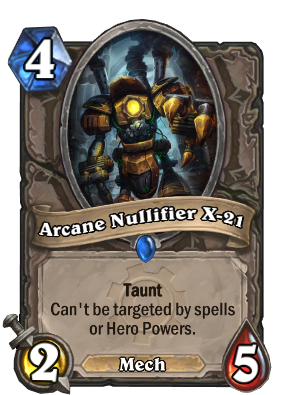 But like I said with the mech synergy with the cards that +2/+2 it, you get a 4/7 spell/hero power immune taunt. Even if it takes a silence thats a silence away from another one of your big guys. It's situationally better. If you're running mech synergy, it's a usually better than Sen'jin. If not, you would probably prefer Sen'jin. Starting to become obsessed with this card. Hard to remove, high chance to perform its function, and combos well with Upgraded Repair Bot to boost that HP up to 9. Got to be careful playing this because he fits perfectly into Stampeding Kodo mana curve. If you use Sen'jin Shieldmasta to survive against aggro, this card is strictly better, because it is guaranteed (well, except for silence) that your opponent needs to trade into it, and most aggro minions have 1 or 2 health. Upgraded Repair Bot and Inner Fire plus Arcane Nullifier could make for a nasty combo. 9/9 with taunt and immunity to spells for 9 mana. Immune to your own spells too, bro...that won't be possible.